Margo's Cabinet Design was founded by Margo Dudley, and as a child raised in rural America following in the footsteps of her father, she learned to love the craft of wood working and cabinetry. Watching an idea spring into reality created in her the desire to achieve in her own right. At eight years of age she watched as her Father spent hour after hour happily engrossed in drawing a plan to build a house for his mother next door to thier home and from ground breaking to clambering up the frame work to hand off two by fours to Dad she enjoyed every aspect. Margo's high school offered classes in woodworking and as she approached the classroom door on the first day of class she saw there were no other females. she hesitated feeling she was invading male territory but walked in with the determination to achieve and love of learning that has stayed with her all of her life. Having the ability to work with wood allowed her to build wall units and a desk for her daughter and watch as they made her life better each day. Margo recently completed a desk for her sister and each time she uses her desk she will know she is loved. It is rewarding to create a lasting gift. Margo has a practical hands on knowledge of cabinetry construction combined with 10 years of helping clients achieve their dreams for a new kitchen. As a woman who loves to cook and bake she understands the need to access items you need quickly and easily. A visiting house guest helping in her kitchen remarked everything was placed where it made perfect sense. As a Cabinetry designer I work with you to combine not only your special look but the function behind the look and resources from cabinetry, counter tops, appliances, lighting , hardware, wallcovering, paint and flooring choices that are all available through Margo's Cabinet Design. 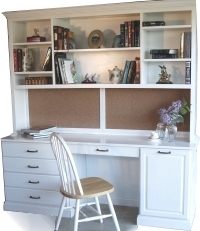 Contact us today and let us help you design and install a custom cabinet design. Design and Technical Maintenance done by Dynamic Business Solutions, Inc.